The gameplay of the series is characteristic of run and gun games: large numbers of enemies and a player character with extremely powerful weapons. In most run and guns, contact with an enemy leads to annihilation. In this series, however, contact results in the opportunity to perform a melee attack and the opportunity for the enemy to perform a melee attack of his own if he has one. The player's melee attack is also much stronger than most shots. This leads to the ability for the player to run in and use melee attacks to take down a number of troops, and the ability to quickly defeat enemies that can take plenty of damage like the mummies in Metal Slug 2. The player starts with only a simple pistol, as the game progresses the player picks up new weapons. The player can only carry one weapon at the time, when a new weapon is found it replaces the old one. Similarly, when the ammo runs out, the player reverts to using the handgun. A new system was implemented with Metal Slug 6 allowing players to carry two larger weapons and switch between them as well as the default pistol. 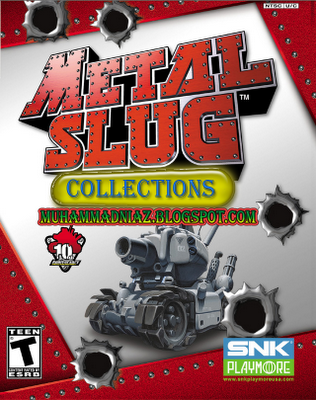 The SV-001 or Metal Slug is the main vehicle of the Metal Slug franchise. It is a small, cartoonish silver-gray tank (SV is short for "Super Vehicle"). The tank is armed with one cannon and twin vulcan cannons. The vehicle can jump and crouch. Crouching opens a hatch on the top of the tank through which grenades can be thrown. The grenades are independent of the cannon's ammo system. The vehicle can run over infantry and perform a suicide attack, with the driver jumping clear and the tank ramming into and exploding upon the target. The vehicle can take three direct hits before it is destroyed. The enemy chaser variant has a shield that must be destroyed before the vehicle can be destroyed. It is propelled by caterpillar treads. Over time, these specifications changed into any vehicle armed with a vulcan cannon and a cannon variant suited to the role of the vehicle, and propelled suitably for that vehicle's environment. In Metal Slug 6 (and the home version of Metal Slug X, 3, 4, 5), Tarma can lock the vulcan cannons into one position and fire continuously. The "slug gunner" is considered the epitome of slug evolution.